I have a real weakness for shortbread. Luckily, it is one of the easiest cookies to make and one of the most versatile. Take this Raspberry White Chocolate Shortbread Cookie which may look like a Linzer Cookie but it is actually two buttery sweet shortbreads that are filled with white chocolate and raspberry jam. They look very festive and make an ideal cookie during the Christmas season or for Valentine's Day with their white coating of powdered sugar and the red raspberry jam poking through the cut out. Sandwich cookies are about contrasts. Whether that means a contrast in flavors and/or textures. With these Raspberry White Chocolate Shortbreads the contrast in flavors is wonderful; two rich and buttery sweet cookies paired with a tangy sweet raspberry jam. When making sandwich cookies you want the cookies all the same size because if the cookies are different sizes they don't fit together perfectly and the filling will leak out. Also, do not overfill the cookies with jam, as you want just enough jam to hold the cookies together. To keep the cookies crisp, it's best to fill the cookies the day of serving or store the assembled cookies in the refrigerator. Although you can easily use a good quality store bought raspberry jam (or preserve) to sandwich the cookies together, I like to make my own. The recipe given here is for a refrigerator jam and it's really easy to make. All you need to do is combine unsweetened frozen raspberries with sugar and pectin and cook it on the stove until thick and glossy (about five to six minutes). Then add a little lemon juice and you're done. Shortbread Cookies: In a bowl whisk the flour with the salt. In the bowl of your electric mixer (or with a hand mixer), beat the butter until smooth (about 1 minute). Add the sugar and beat until well combined. Beat in the vanilla extract. Gently stir in the flour mixture just until incorporated. Divide the dough in half and then roll each half between two sheets of parchment or wax paper until it is about 1/8 inch (6 mm) thick. As you roll, periodically check the top and bottom sheets of parchment and smooth out any wrinkles. Place the dough on a baking sheet (along with the parchment paper) and place in the refrigerator until firm (about 30-60 minutes). (For faster chilling, place in the freezer for about 15-20 minutes). Once chilled, remove from refrigerator and peel off the top piece of parchment paper. Using about a 3 inch (7 cm) heart shaped cookie cutter, cut out the cookies. 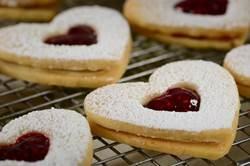 Use a smaller heart shaped cookie cutter to cut out the centers of half of the cookies. (You will be sandwiching two cookies together and there will be a small 'window or cut out' in the top cookie so you can see the jam underneath.) Place the cookies on a baking sheet lined with parchment, spacing the cookies about 2 inches (5 cm) apart. Then put the baking sheet with the unbaked cookies in the refrigerator to chill while you preheat the oven to 350 degrees F (180 degrees C). Bake the cookies for about 10 minutes, or just until cookies are lightly browned around the edges. Cool on a wire rack. To Assemble Cookies: Place the cookies with the cut-outs on a wire rack and dust the tops with the confectioners' (powdered or icing) sugar. On the bottom surface of the full cookie (top of cookie will face out) spread a thin layer of melted white chocolate. Cover with a thin layer of jam (about 1/2 teaspoon). Place the cut-out cookie on top and gently sandwich them together, making sure not to smug the confectioners' sugar. Using a small spoon, fill the cut-out with a little more jam. Makes about 12 - 14 sandwich cookies. Note: You can store the assembled cookies for several days in an airtight container in the refrigerator. Raspberry Jam: In a small bowl stir the pectin into the sugar. Place the frozen unsweetened raspberries and the sugar mixture in a medium sized saucepan and bring to a boil, stirring frequently, over medium heat. When it's at a full boil, adjust the heat to keep the mixture at a full boil and, stirring frequently, cook for about five to six minutes. Do not let it burn. (As the jam boils, you will notice large bubbles and some foaming. You can skim off the foam if you like. As the jam continues to boil the foam will subside, the bubbles will get smaller, and the jam will become darker in color with a glossy sheen.) Remove from heat and, if you like, do the 'Freezer Test' to check its consistency. Place a little jam on a frozen spoon, wait a minute for the jam to cool down, and check the consistency. If the jam isn't firm enough, return the saucepan to the heat and cook the jam a little longer. Once made, stir in the lemon juice and, if desired, strain to remove the raspberry seeds. Transfer to a heatproof jar or bowl and let cool. Then cover and store in the refrigerator for up to two weeks.